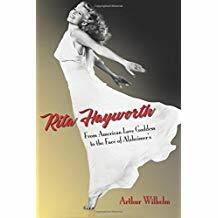 In “Rita Hayworth: From American Love Goddess to the Face of Alzheimer’s,” the author shares the actress’ career, achievement, private life, advocacy, as well as inspiring readers of her journey and struggle with Alzheimer’s disease. Celebrate the life of Rita Hayworth and discover the relevance of her story in today’s society. Arthur Wilhelm puts the spotlight back to pay tribute to the life and career of the American Love Goddess Rita Hayworth. He shares the actress’ journey from her childhood to her rise to fame. He also tells of her Hispanic roots, being born into a family of Spanish dancers, her screen debut, and how she survived a makeover that tried to erase her Hispanic heritage. “Rita Hayworth” talks about her life during the height of her career. This tribute shares how her films were viewed in the 21st century. This book also highlights her femme fatale roles that touch on subjects like women liberation and homosexuality. Most of all, this book highlights Rita’s struggle with Alzheimer’s Disease. Hoping that this will spark hope, inspiration, and support among readers who have family members struggling with the same disease. Ultimately, Wilhelm brings understanding and compassion to the actress’ struggle in this one-of-a-kind tribute. Arthur’s tribute and memoir will soon grace the bookshelves of the upcoming 2018 Frankfurt International Book Fair. “Rita Hayworth” will be a part of the world’s largest trade fair for books along with thousands of other titles. This wonderful affair happens on October 10-14, 2018 so be sure not to miss it! Arthur Wilhelm grew up in North Carolina and graduated from Catawba College. He earned an MA in English from Emory University and an ED.S in Language Arts and a Ph.D. in English from Georgia State University. In addition, he has studied at the University of Besançon (Doubs), France, and the Alliance Française de Paris. He is the author of a dissertation entitled Maurice-Edgar Coindreau: America’s Literary Ambassador to France as well as several articles about Southern writers, most notably William Faulkner, and their critical reception in France. In 1990, he was honored at a White House reception as the National Endowment for the Humanities Georgia Teacher-Scholar for 1990-91. After retiring from thirty-five years teaching in the Atlanta area, he moved to Palm Springs, California, where he continued to teach for ten years at Palm Valley School in Rancho Mirage. He currently lives in Palm Springs with his partner, also a retired educator.